The Jeol JEM-1400 transmission electron microscope. relies on visualisation of the infective particles in the electron microscope. The identification of novel and exotic viral pathogens which appear from time to time in our farm animals (for example avian influenza and Newcastle disease) often must be confirmed by examination of images at high magnification. The electron microscope is taking an increasingly important role in Parasitology research because examination of ultrathin sections of worm parasites at high magnification enables us to characterise the types of damage inflicted on these organisms by anthelmintic drugs, thus providing a valuable aid to identifying strains of parasite that are resistant to the available drugs. The work in Parasitology carried out in the electron microscope unit at the Veterinary Science Division, AFBI is part of on-going joint research with Queen's University and is supported by EU funding, because of the worldwide recognition of the importance of evolving multiple drug resistance in parasites of veterinary significance. Electron microscopy is, in addition, a valuable tool for the investigation of the most subtle effects of disease-causing organisms and toxic substances on animal cells and tissues. It often provides the first line of evidence in the investigation of newly emerging diseases, and still represents the mainstay of research in veterinary pathology, toxicology and oncology. 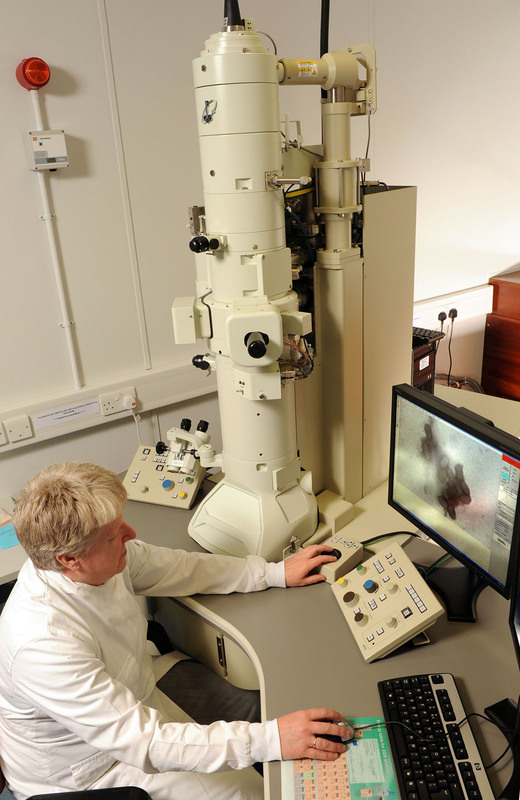 The electron microscope at VSD, Stormont, can be made available for external users with suitable, funded, biological work programmes.